Every year, there are trillions of searches on Google and over half of those searches happen on mobile. Across the millions of websites using Google Analytics today, we’re seeing more than half of all web traffic now coming from smartphones and tablets. When we asked people to describe the role smartphones play in their lives, they used phrases like “attached to my hip”, “butler” and “lifeline.” Smartphones have become the companion that people turn to in I-want-to-know, I-want-to-go, I-want-to-do and I want-to-buy moments throughout the day. To help marketers succeed in this mobile-first world, Google has redesigned AdWords — from the ground-up — and re-thought everything from creatives and bidding, to workflow and measurement. 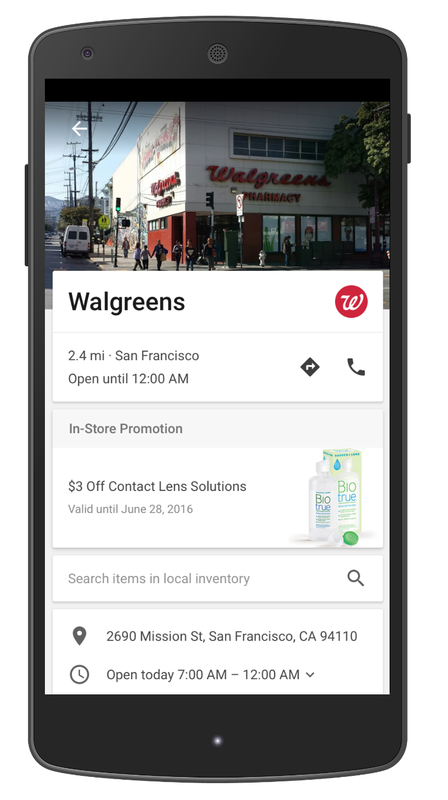 Google has also made it easier for marketers to bridge the digital and physical worlds. With location-related mobile searches growing 50% faster than all mobile searches, it’s clear that consumers are moving seamlessly between online and offline experiences. So it’s important to help marketers think this way too. Over the last several years, Google has discovered that accounting for mobile and designing for mobile-first are two very different things. That’s why they’ve completely transformed how they think about and build AdWords. In order to enable advertisers and developers to drive more downloads of mobile apps — across Google properties — they’ve built Universal App Campaigns. To date, Universal App Campaigns has delivered more than 2 billion downloads for advertisers, across Google Search, Google Play, YouTube, and the Google Display Network. In May of 2016 at Google I/O, Google announced that this campaign type is now available on iOS. Today, Google has brought broader changes to advertising with them, from how text and display ads work, to the way advertisers optimize campaigns. What do text ads look like in the mobile-first world? Mobile has revolutionized the canvas where ads live. Earlier in 2016, Google removed right-hand side ads on desktop to improve the search experience and make it more consistent across devices. This paved the way for them to introduce the biggest changes to their text ads since AdWords launched fifteen years ago. Based on early testing, some advertisers reported increases in clickthrough rates of up to 20% compared to current text ads. How do display ads look in a mobile-first world? From sites to apps to videos, mobile has unlocked a universe of new spaces to reach consumers. Responsive ads for display adapt to the diverse content across the more than two million publisher sites and apps on the Google Display Network (GDN). They also unlock new native inventory so you can engage consumers with ads that match the look and feel of the content they’re browsing. Simply provide headlines, a description, an image, and a URL — and Google will automatically design these beautiful responsive ads. What does bidding look like in a mobile-first world? Marketers need more control and flexibility to optimize bids on specific devices. Advertisers can now set individual bid adjustments for each device type — mobile, desktop and tablet. This lets you anchor your base keyword bid to the device most valuable to your business and then set bid adjustments for each of the other devices. You also have a wider range to adjust bids, up to +900%. With more controls, you can now optimize with greater precision while keeping things simple with a single campaign that reaches consumers across devices. 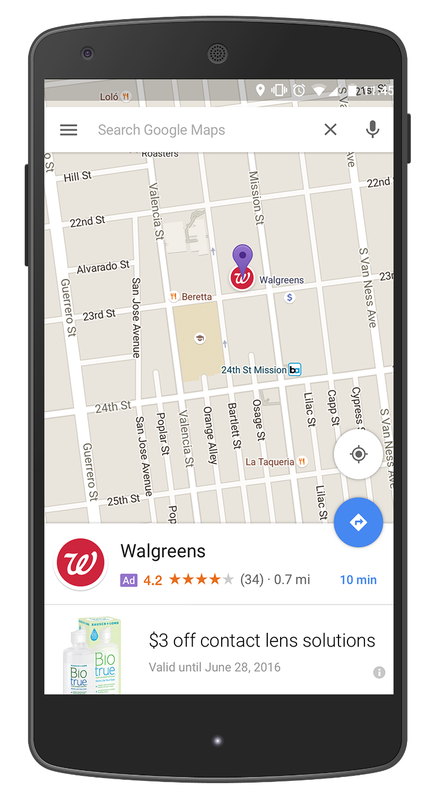 Google is also investing in more branded, customized experiences for businesses on Google Maps — geared towards helping you increase store visits. Google is currently developing and experimenting with a variety of ad formats on Maps that make it easier for users to find businesses as they navigate the world around them. For example, Maps users may start to see promoted pins for nearby coffee shops, gas stations or lunch spots along their driving route. Local business pages are also getting a brand new look — to encourage consumers to explore your store before they even arrive, they’re adding new features like special offers and the ability to browse product inventory. Businesses across a variety of industries around the world are using insights from AdWords store visits to measure the impact of online ads on offline activity. Nissan UK discovered that 6% of mobile ad clicks result in a trip to a dealership, delivering an estimated 25x return on investment. As consumers live their lives online and blur the lines between online and offline, it’s more important than ever to build your business for mobile. Google’s building for this mobile-first world as well and we’re all excited to go on this journey with you.